The following is a synopsis of the tern status in southwest Nova Scotia for the 2003 nesting season. My "tern" work and observations deal primarily with the tern colony on The Brothers. These two tiny islands are located about 1 km offshore from Lower West Pubnico in Yarmouth County. The tires I had placed on North Brother, years ago, were removed on April 14. They had been there long enough on the island with no success. No gulls nested on The Brothers in 2003. The 9 x 12 ft. tarps I had placed on N. Brother in 2001 have become a great success. 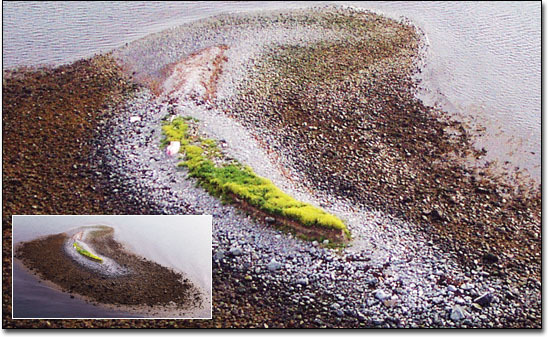 The two tarps were placed over a non-productive, heavily vegetated area of the island and covered over with soil. A number of nesting shelters were placed over the tarps. With little or no nesting success for the first two years, this year showed a turn around and an acceptance by the terns, with six Roseate Tern nests on each tarp. There was a slight decrease on the number of tern nests on The Brothers in 2003, with 648 on N. Brother and 102 on S. Brother. 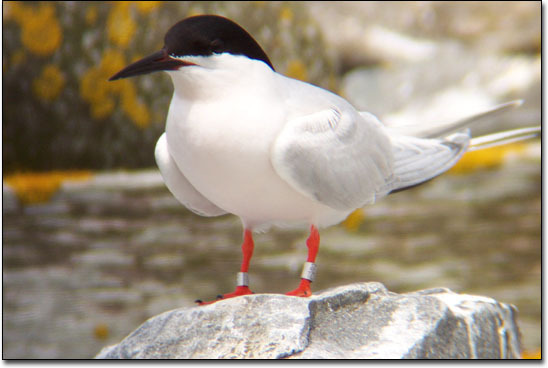 The number of Roseate Tern nests, at 86 on The Brothers, was slightly down from the 2002 season. Fledgeling success, though, was pretty close to zero, due to predation by a mink. 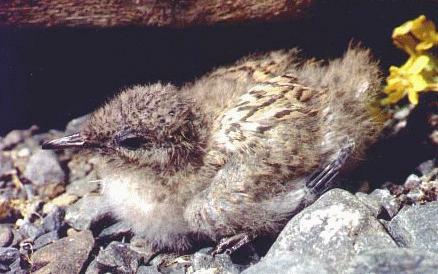 It is quite possible no Roseate Tern chicks fledged from The Brothers in 2003. Andrew Boyne and Jason Beukens of Canadian Wildlife Service were on The Brothers on July 3, 2003, when the mink kills were discovered. At the time we were not sure of the cause of the mortality. Upon casual examination, the dead birds appeared intact as if they had died from a disease. Many carcasses were sent to the Atlantic Veterinary College (AVC) at the University of Prince Edward Island to determine the cause of the mortality. The report determined most of the deaths were caused by a mink. By the time the mink was captured, there were very few tern chicks left alive and a small number of adult terns had also been taken. 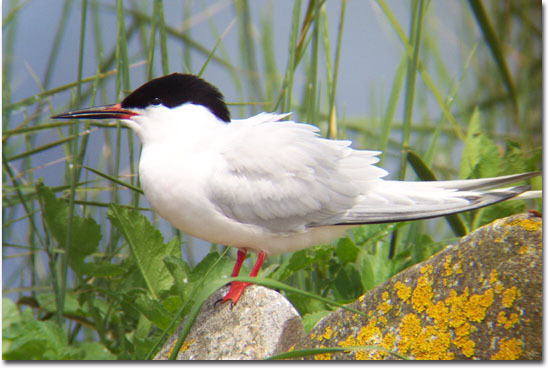 Ile-aux-fraises (Green Island) had 362 tern nests on June 21/03. About 97% were Common Terns with only a few Arctic Terns. Green Rock (also shown as "Green Island" on the charts) had about 10 Arctic Tern Nests. Little Half Bald Tusket Island had a new tern colony in 2003. I did not land on the island but only motored by. My guess is there were between 50 and 100 tern nests there. The following is a chronological listing of my 2003 work with terns in general, of the Lobster Bay area, but especially with the Roseate Terns of The Brothers. The report also includes tern observations from other local residents. April 14, 2003 - With Daryl Gunter, I brought 4 wooden pallets to North Brother, for use as Roseate Tern nesting shelters. We also removed about 9 automobile tires from the island. The tires had been used unsuccessfully as Roseate Tern nesting shelters for many years. April 18, 2003 - N. Brother - Andrew D'Eon and Alix d'Entremont helped me to replace the rotting tops on sixteen 16"x16" Roseate Tern nesting shelters with new ones. April 19, 2003 - My son, Nigel and his friend, Terra Nova, came with me to N. Brother to do more maintenance work. 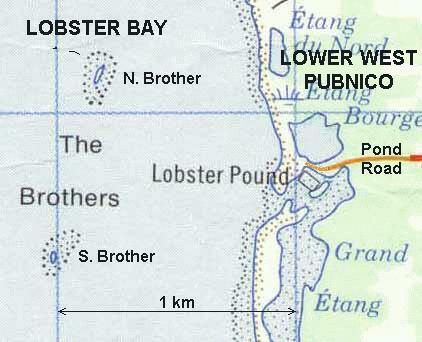 April 26, 2003 - A report that Lobster fisherman, Chris MacKenzie saw a "tern" resting on a lobster buoy a few kilometers west of The Brothers. May 1, 2003 - Fixed up a few more nesting shelters on both Brothers with Israel d'Entremont. 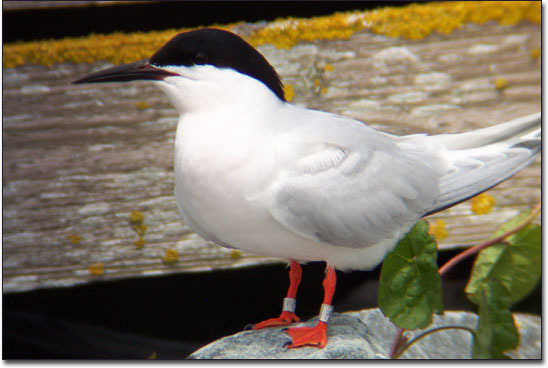 May 1, 2003 - Lobster fisherman, David Surette, reported 25 to 50 "terns" in an area a few kilometers to the west of The Brothers. May 5, 2003 - Went to Île-aux-fraises (Green Island) to remove 4 unused Roseate Tern nesting shelters for later placement on The Brothers. There were 15 Common Terns on the island. My first terns for the season! We then continued to Flat Island where we saw about 100 Black Brant, a pair of Canada Geese, a pair of Teals and several ducks thought to be Gadwall. The usual 20 or so Common Eiders were there also. At Noddy Island we could find no Puffins nor Black Guillemots. I expected to see lots of them here. My crew: Rémi d'Entremont and his brother, Laurent. 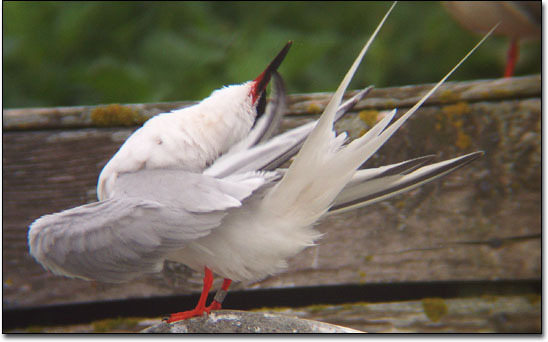 May 6, 2003 - The "terns" have arrived on The Brothers. Lobster fisherman, Robert Nickerson reported 15 "terns" above North Brother. 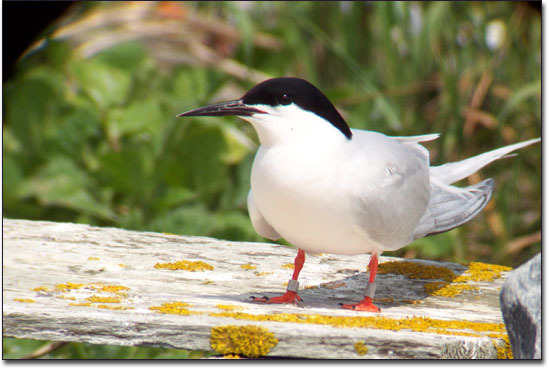 May 17, 2003 - About 100 Common and Arctic Terns on N. Brother, 2/3 of them being Common. No Roseate Terns yet. No terns at all on S. Brother. 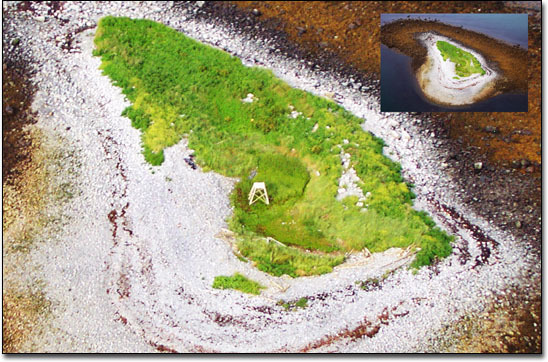 Placed the four wedge-shaped nesting shelters from Île-aux-fraises, on N. Brother. Continued to the "Mud Islands". 15 Puffins, 200 Black Guillemots and three possible Harlequin Ducks at Round Island. I personally only got a glance at one of the "Harlequins" and thought it was a female Surf Scoter. The birds were in the water at the surf line on the east side of the island. After returning home and checking out my field guide, I questionned the identification. Now I am pretty sure they were Harlequins. On Flat Island we estimated 30 Arctic Terns and about 100 Black Brant. We could see another 200 Brant flying over Round Island. There were 3 Gadwall in the pond of Flat I. 5 Mallard size, unidentified ducks flew away. Next to Mud Island where there were another 3 Gadwall in one of the ponds along with a pair of Green-wing Teal and some other unidentified ducks. 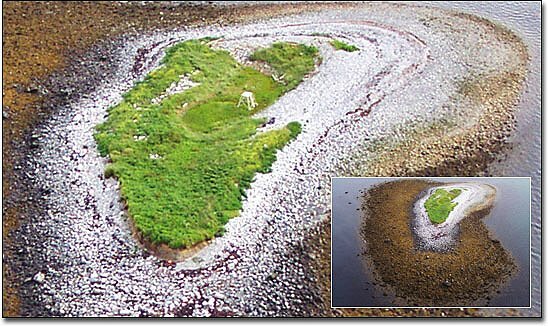 Hundreds of Common Eiders nest on Mud I.; perhaps less than 100 on Round Island and a few dozens on Flat and Noddy islands (these are estimates from previous years). Still on Mud I., we saw a Snowy Egret, a Greater Yellowlegs and pair of Canada Geese with a nest containing 6 eggs. At Noddy I. were about 15 Puffins and a only small number of Black Guillemots. I expected to see many more Puffins than this. My crew: Rémi d'Entremont, Alix d'Entremont, Jean-Bernard d'Entremont, Israel d'Entremont and Raymond S. d'Entremont. May 26, 2003 - Visited The Brothers with Daryl Gunter. The Roseate Terns had arrived! It was difficult to determine how many there were; perhaps 20 of the 250 terns on N. Brother and 2 or 3 from the 25 terns on S. Brother. No gull nests were found on either island. Of great note were the number of tern nests - 210 on N. Brother and one nest on S. Brother. All but the two Roseate Tern nests were Common and Arctic Tern nests. 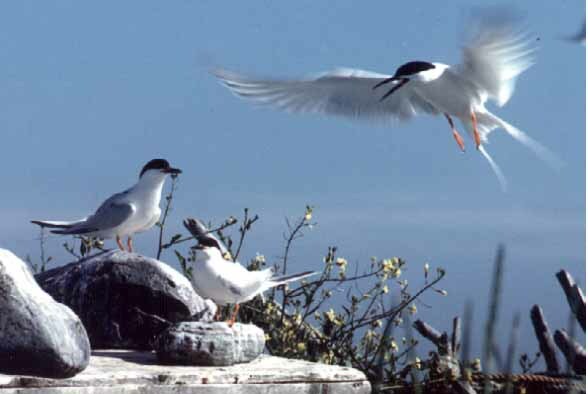 From the numbers of terns in the air above the islands, the majority of nests would be Common Tern's. 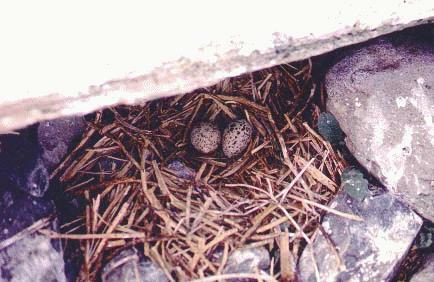 June 13, 2003 - Tern Nest Count on The Brothers. Of these 750 nests on The Brothers, 68 were Roseate Tern's. I expect another 20 more Roseare Tern nests over the next couple of weeks. 15 chicks had already hatched, however none of these were Roseate. One Willet's nest with 4 eggs was found on N. Brother and 4 Common Eider nests were found on S. Brother. No signs of any predators were observed; the islands were in great shape. The two tarps I had placed on N. Brother a couple of years ago with very little nesting success have now become very productive. 5 Roseate Tern nests on one and 4 on the other! Nest shelter = Roseate Tern nest shelters mostly built by myself - 16 inch x 16 inch top with three 5 inch sides, open front and no floor. 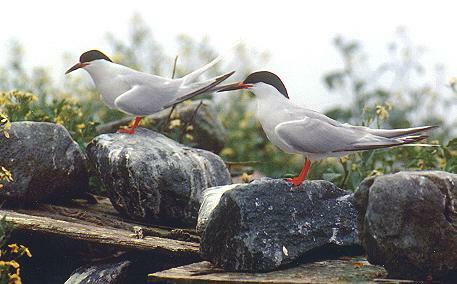 June 21, 2003 - 362 tern nests were counted on Île-aux-fraises (Green Island). About 97% Common Terns with a few Arctics. 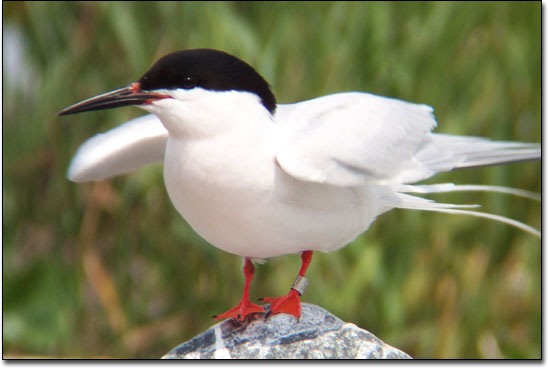 No tern activity was seen at Île-aux-maringouins (Pinch-Gut Island) and The Thrum. Of note is a Bald Eagle nest on one of the Argyle islands. It would be the first such nest in recent history. We could see the two adult eagles near their nest however we were not able to see any nest activity. Likely there were eaglets. My crew: Israel d'Entremont, Rémi d'Entremont, and Andrew D'Eon. June 25, 2003 - Roseate Tern Nest and Chick Count on The Brothers. Roseate Tern nest number increased to 79! 8 more on N. Brother and 3 more on S. Brother. 54 Roseate chicks or eggs hatching. 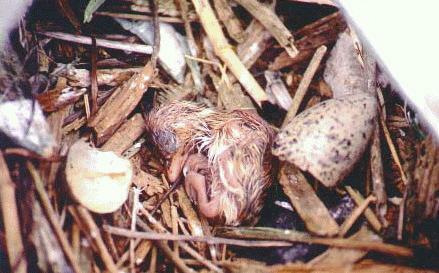 Only one dead Roseate Tern chick. Oldest chick about 5 days old. Most were 1 to 3 days old. Jean-Bernard d'Entremont helped me with the count. 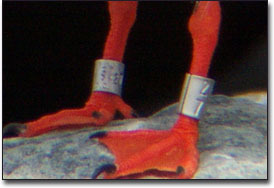 July 3, 2003 - Leg banding day for the Roseate Tern chicks on The Brothers. I accompanied Andrew Boyne and Jason Beukens of Canadian Wildlife Service (CWS). Dr. Carl Safina, prize-winning author and scientist of Amagansett, Long Island, was also with us. Carl has had a lot of experience with Roseate Terns and has authored many papers on the subject. We were not prepared for what we found on The Brothers. Roseate Tern death was everywhere. I expected we would band 60 Roseate Tern chicks. Instead, we did not even get to 20. Most of the chicks were dead. Worse still, 5 adult Roseate Terns, most of then inside nesting structures, were also found dead and in contorted positions. 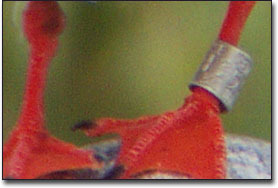 One adult Arctic Tern with leg bands was also a casualty (right leg - BH/80, left leg 1182-61492). Carcasses were collected and taken to the Atlantic Veterinary College (AVC) at the University of Prince Edward Island to determine the cause of the mortality. Of note is the fact that no mortality was found on the tarp which was slightly isolated from the rest of the colony. On June 25 there were 5 nests containing 5 Roseate Tern chicks. On July 3 we found a sixth nest with 2 eggs, but only 2 chicks. However, we found no dead chicks on the gravel covered 9 ft. x 12 ft. tarp. In spite of the mortality, 6 new Roseate Tern nests were found, bringing the total now to 85. As to the cause of the massive death. My money is on Avian Cholera. I should know for certain on July 7. 2003 will certainly go down as a devastative year for all the terns on The Brothers. No live tern chicks were found on S. Brother. July 7, 2003 - I received a phone call from Kevin Davidson of CWS Sackville, New Brunswick. He informed me the AVC report on the cause of death of the terns was due to attack by mink. I have to admit I was skeptical of the validity of the report and wondered if they had checked the right birds. However, mink was definitely better than cholera. That evening, I went to N. Brother with Israel d'Entremont, Rémi d'Entremont, my daughter, Ingrid, and her fiancé, Jessie. I brought with me a "live" trap baited with hamburger to see if we could capture the mink. I collected another 12 Roseate Tern chicks, 3 Roseate Tern adults and about 15 dead Common Terns to be frozen until a later pick up by CWS. Another Roseate Tern nest was found, bringing the total now to 86. July 9, 2003 - The Nova Scotia Department of Natural Resources (DNR) hired Mr. Paul Tufts, a most respected trapper and former employee of DNR, to trap the mink. He arrived on N. Brother with DNR biologist, Peter MacDonald, and placed 7 more traps on the island. Mink evidence on the island was abounding. Tooth puncture marks on the necks of most of the newly dead tern chicks were seen, as well as mink foot prints in the loose soil at the edge of the island. More specimens were collected and, later that day, taken by CWS for analysis. July 10, 2003 - A quick visit to N. Brother. All traps appeared untouched. July 14, 2003 - The mink has been caught. Israel d'Entremont and I went to N. Brother in the afternoon to check the traps. A large male wild mink was dead in a Conibear trap. It was colllected and taken to DNR the next morning. It appeared to have been in the trap for a couple of days. There were no signs of any new dead terns and no live Roseate Tern chicks could be located. There were, however, some Common or Arctic Tern eggs hatching and there were still some Roseate Tern eggs being incubated. As to the adults terns at the colony, their activity appeared pretty well normal, as if they were not aware of the catastrophe. The traps remained set on the island until my next visit, just in case there might be a second mink. July 21, 2003 - I removed the mink traps from N. Brother. There were no new dead terns and I saw no live Roseate Tern chicks. Some newly fledged Common Tern chicks were being fed by adults. There was still a lot of tern activity above the island including adults carrying fish, though some of the terns had already left the island.